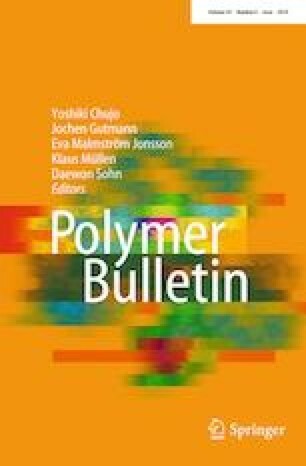 A smectic liquid crystal polysiloxane containing cholesteryl groups (SLCP-NA) was synthesized and used as a new kind of β-nucleating agent to induce the formation of β-crystal in isotactic polypropylene (iPP). The nucleating ability of SLCP-NA was investigated using wide-angle X-ray diffraction and differential scanning calorimetry. The content of SLCP-NA and crystallization temperature could lead to substantial changes to crystallization behavior of iPP. As the SLCP-NA content and crystallization temperature increased, the relative content of β-crystal (Kβ) tended to first increase and then decrease. The Kβ value reached a maximum value of 66.3% when the mass fraction of SLCP-NA and the crystallization temperature were 0.2 wt% and 120 °C, respectively. In addition, the rheological behavior of the iPP/SLCP-NA blends was studied. Exhilaratingly, a little mass fraction of SLCP-NA was found to greatly improve the flow ability of the blends, and the melt flow rate increased from 2.9 g/10 min of pure iPP to 43.9 g/10 min of the iPP blend with 0.3 wt% SLCP-NA. Moreover, the addition of SLCP-NA could decrease temperature sensitivity and increase shear sensitivity. This study was supported by Fundamental Research Funds for the Central Universities (N160504001), Doctor Start Funding of Liaoning Province (201601379), Strengthening the Police Force with Science and Technology Foundation Works Special of Ministry of Public Security (2017GABJC14), and Central Public Welfare Research Institutes of basic research special operations (CA268).